The CS100 available from Campbell Scientific Aust is a barometric pressure sensor. The standard barometric pressure range is 600 to 1100 mb, which is approximately sea level to 3660m (12000 feet). The CS100 is manufactured by Setra as their Model 278. 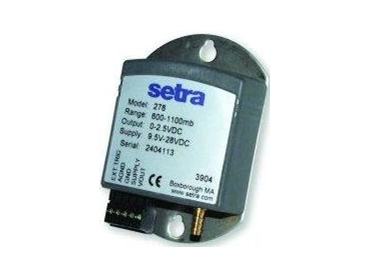 Designed for use in environmental applications, the Setra 278 typically housed in the data logger enclosure.